Melissa at The Inspired Room had Fall Nesting Week with lots of people linking up with their decorating or Fall ideas. Be sure to stop by her place and be inspired by the many Fall nesters! You can link up there until the end of September. I was inspired to make my first attempt at Fall nesting. Then I was further inspired to try a couple more ideas with Fall tea settings. I have to remind you that I do not possess much decorating sense, so these are just beginner's attempts. I know many of you could turn these into something truly amazing. But they do make me happy when looking at them and I am feeling more like Fall! Then I thought I could try a Fall orange tea setting. I know the white teapot seems odd, but I like it and like the contrast for some reason. And I realized that my turkey platter coordinated, so I put it behind. 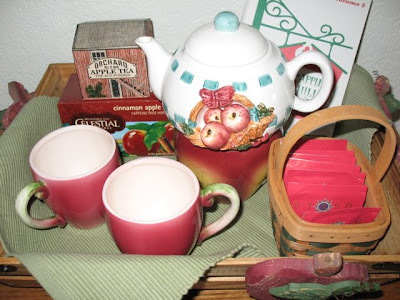 Have you thought about getting out your tea things to use in your Fall decorating? I think your presentations are beautiful. I would proudly display them! We are decorating for fall next Monday. You know the "offical" day of fall lol. I wish I could sit down with you and sip some of that tea and eat some chocolate lol. 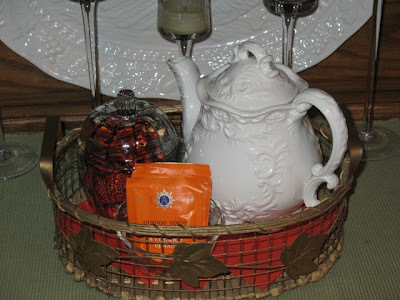 You did a beautiful job displaying your tea things for fall! I really like the variety. Yes, I've been thinking about my fall Tea Corner quite a bit lately. Just waiting for the temps to drop out of the 90's long enough to "feel" it! You must be close by. Takes me about an hour to get to Apple Hill. Your effort is quite nice, novice or no. I love Apple Hill! How neat that you are in the area too. Did I already know that? LOL. I love the orange tea setting - how homey and warm! Your decorating is very pretty! I LOVE fall season! It doesn't come here till about November,but I still love it! I am going to decorate soon! I love leaves and pumpkins! :) I like your blog! God Bless you! Oh, I love orange tea! I haven't done this for awhile, just do to busyness, but one of my fall traditions used to be creating a little basket of tea samples and sugars to share with guests. I loved pulling cute little basket out on a cold morning to share with friends! I don't think the white teapot looks odd at all. 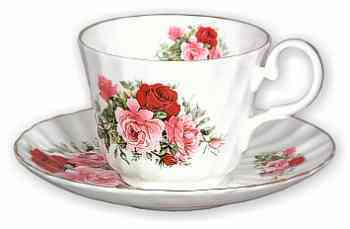 The design is ornate and reminds me of times past. Fall puts me in such a reflectivem mood that I often think of loved ones from my past. So I "feel" the fit. It looks lovely. Thanks for stopping by my blog (and not gagging your way back out after reading about my Denny's moment, lol).